A few weeks ago, I took in the beauty and views of Albuquerque, New Mexico and Tucson, Arizona. I had interviews scheduled at the Univ of New Mexico family medicine residency program and the University of Arizona family medicine residency program. I decided to extend my interviews into a small vacation and spent a few days with friends in each town. In Albuquerque I stayed with my friend and co-host of this blog, Andru Ziwasimon. I'm always reinvigorated and re-inspired after hanging out with Andru and other wonderful people there -- Mara, a 2nd year family medicine resident; a few other family medicine residents; and John Fogarty and Lucy Boulanger, wonderful physicians who work in the Indian Health Service and do some state-wide organizing around environmental issues; and some non-medical activists and artists. During my stay in Abq, I had the privilege of seeing the wonderful medical clinic that Andru's setting up, aptly named "Just Healthcare". The clinic is meant to serve people regardless of insurance status or documented vs undocumented status. In fact, Andru won't even accept health insurance, not out of hostility to those who have it, but because accepting health insurance would mean he would need to employ several people full-time just to deal with the billing aspects (the inefficiencies of our health care system require such staffing). This clinic is a peoples' clinic, a grassroots effort. What does that mean? Community members have helped in every way possible to build it (also see earlier post by Andru on this topic). Some donated concrete for the wheelchair access ramp, others painted the rooms vibrant colors, others donated their creative talents to paint a beautiful wall painting in the waiting room area, and yet others tiled the floors of one of the rooms. Medical equipment was also donated from various places in New Mexico. 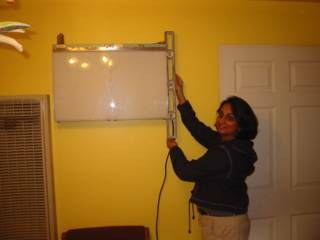 In the picture above, I'm showing off how level the x-ray reader is, after Andru and I installed it in an examining room). And with this, I wish you all an inspiring 2005 -- the year of thinking outside the box.